Chidiya Tapu is a place located at 30 km away from the main city. This place is known for its sunset view and not forgetting the bird watching. Chidiya Tapu means “bird’s island”. This place if found at the southernmost tip of the south Andaman island. It is a small village having green mangroves and tranquil islands. They say that this is a paradise for bird watchers, but one can get extremely distracted by the landscapes. It has a number of panoramic scenic beauties and also many colours of oceanic beauty. It is popularly known as the sunset point. In port Blair, it is one of the best places to see the sunset. At the top of the hillock there is a forest guest house which provides the best sunset views as well as the view of the islands. This region has bright corals in the water which makes it an excellent site for snorkelling. There is salt water crocodiles situated here. Chidiya Tapu has many attractions such as the Chidiya Tapu biological park, Chidiya Tapu beach, the sylvan sands and not forgetting the Munda Pahar beaches. It is a kind of a mini journey. It was established at Port Blair. It has a good road-link and transport facility with Port Blair. It came into existence in 2001. The aim of this park is to conserve and study the endemic and endangered species of animals found in Andaman and Nicobar Islands. One can find the rich fauna of islands. Other than birds one can spot wild pigs as well as barking deer and spotted deer. There are saltwater crocodiles found here. Those who are in love with reptiles would definitely enjoy this place. In future, there would be an aquarium, an insectarium, a reptile house, a walk in aviary and also a butterfly house that would make this place more beautiful than ever. These beaches are in the southern part of Andaman and Nico bar islands at Chidiya Tapu. There is a sunset point here, no doubt gets a beautiful view of the sunset. This place has rich aqua fauna. There is an excellent place for trekking near the Munda Pahar. These two beaches are very famous for snorkelling. The beach is about 2 km away from Chidiya Tapu. These are the prime attraction of this place. 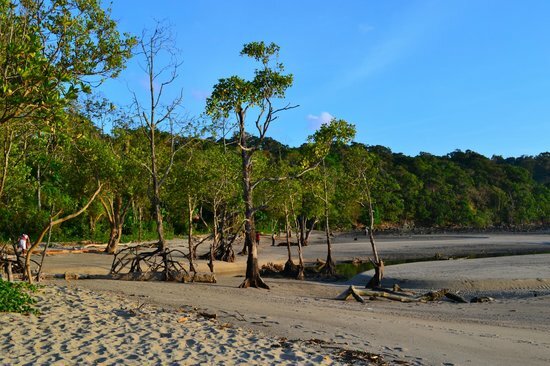 Chidiya Tapu is Andaman’s best sunset beach ever. It is also known as sunset point or Birds Island. It is one of the best places, recommended by all most everyone to see the sunset. Port Blair is the main hub of the Andaman Islands. When one visits this beach it gives a sense of relaxation. Though this beach is small in size, it has large scenic beauty. This beach is flanked with sea walls. There are green mangroves forest found here. It relaxes one’s mind. The speciality of this place is that, there are 46 varieties of endemic birds found here. There are also a number of white spotted deer, barking deer and of course not forgetting the seasonal orchids. There a lot of driftwood that is washed on the beach. One can spend hours looking at that driftwood. There is trail which is offered by Chidiya Tapu that leads through the dense jungles up to Munda Pahar. The trek is worth the walk. The best time to visit is from October to May. This is because the waters are clear and calm which is perfect for snorkelling and swimming. And also the temperature is not too high; it ranges between 23oC to 30oC. Chidiya Tapu is just the perfect place for the person who loves nature.